Hardware stores sell products such as power tools, hand tools, vacuums and general hardware materials, according to the Home Depot website. General hardware materials include nails, nuts, bolts, screws and locks. Many hardware stores also offer services and rewards programs. Top categories in hardware include safes, fasteners, door knobs, cabinet and furniture hardware and mailboxes, explains the Home Depot website. Fasteners are nuts, bolts, screws and anchors. Hardware stores also sell miscellaneous items such as ladders, generators, air compressors and automotive parts. Almost all hardware stores sell power tools, such as drills and saws, and hand tools. Accompanying accessories and drill bits are also available where power tools are sold. 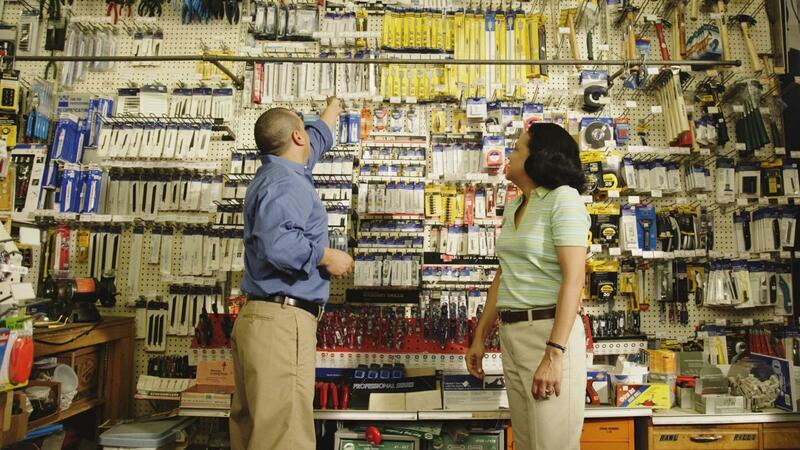 Hardware stores sell services to consumers, states Ace Hardware. The types of services vary widely depending on the store. Key cutting, rentals, screen repairs, glass repairs and installations are some of the most commonly offered hardware store services. Most hardware stores also sell propane and paint, along with paint-matching services. Certain hardware stores may also offer USPS services. Some hardware stores offer rewards programs to customers, as seen on the Lowe's website. Easy returns and access to purchase records are some of the benefits of rewards programs. Some rewards programs also grant customers access to at-home hardware inventory systems or periodic inventory reminders. What Home Improvement Products Does Lowe's Sell? What Qualifications Do You Need to Work at a Hardware Store? What Are Some Tips for Building a Cabin by Hand? Can You Rent a Log Splitter From Home Depot? What Can You Buy in a Home Depot Center? Where Can You Buy a Furnace Filter? Where Can You Buy Minwax Stain Colors?